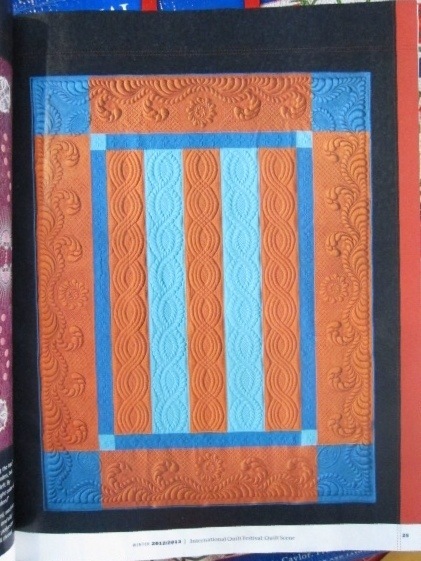 IQA notified the finalists selected for the 2012 “Quilts: A World of Beauty” judged show in Houston yesterday and Five Bar Blues is going to the Houston International Quilt Festival this year! Although it’s always tough to pack and ship any quilt (it feels like I am giving my quilt away to the shipping company) — I’m always very excited to have the opportunity to show my quilts, especially outside of the New England area. This is the second year the Houston Quilt Festival judged show will include one of my quilts in the exhibit. Last year, my miniature quilt Square In Square I was a finalist in the IQA Houston show and won 3rd place in the miniature category! Square in Square I has traveled to the 2012 spring and summer IQA venues as part of the IQA special exhibit “Quilts: A World of Beauty 2011“. 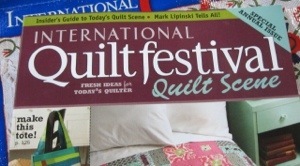 Next week is the last stop for this exhibit at the International Quilt Festival in Long Beach, from July 27-29, 2012. If you are going to the Long Beach show, check out this special exhibit and look for Square in Square I (it is only 14″ square!). More Five Bar Blues News…..
Did you see Five Bar Blues on the cover of the 2012 Paducah Show Catalog?? (In my defense….) I did not know in advance that the America Quilter’s Society planned to use a photograph of Five Bar Blues on the cover of the 2012 Paducah Show Catalog, and didn’t find out until a few weeks after the show was over. When a dedicated fan and friend emailed to congratulate me after she saw that Five Bar Blues was ‘all over’ the Paducah catalog…. I had no idea what she was referring to! I finally saw a copy of the catalog and understood her excitement. In addition to the cover, images of Five Bar Blues are on every page in the catalog. 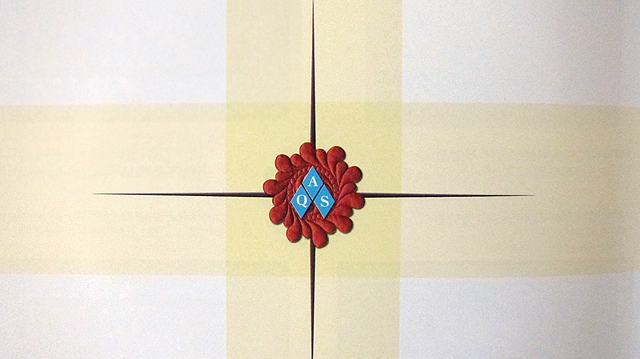 Yes – the AQS icon sits nicely centered inside one of the feathered wreaths from the border of Five Bar Blues. The 2012 AQS Paducah catalog is available for sale from AQS here and (also, of course) has photographs of all the stunning quilts entered in the 2012 AQS Paducah quilt show. Check it out!